At the last minute, mix all ingredients of gremolata and set aside. — Flour the lamb. In a skillet, heat 60 ml (1/4 cup) of olive oil and brown the meat on all sides. Season generously and reserve in a covered baking dish. In another skillet, heat 60 ml (1/4 cup) of olive oil and sauté the vegetables and oregano. Cook for 2 to 3 minutes at medium heat and moisten with white wine and broth. Place the mixture on the lamb, cover and cook in the oven for approximately 3 hours, turning the shanks every 30 minutes. Slow cooking is the secret ingredient of this recipe. Your patience will be rewarded with a succulent dish. FINALE — When you serve the lamb, drizzle it with the cooking juices and sprinkle generously with the gremolata, which will enhance all the flavors of this dish. 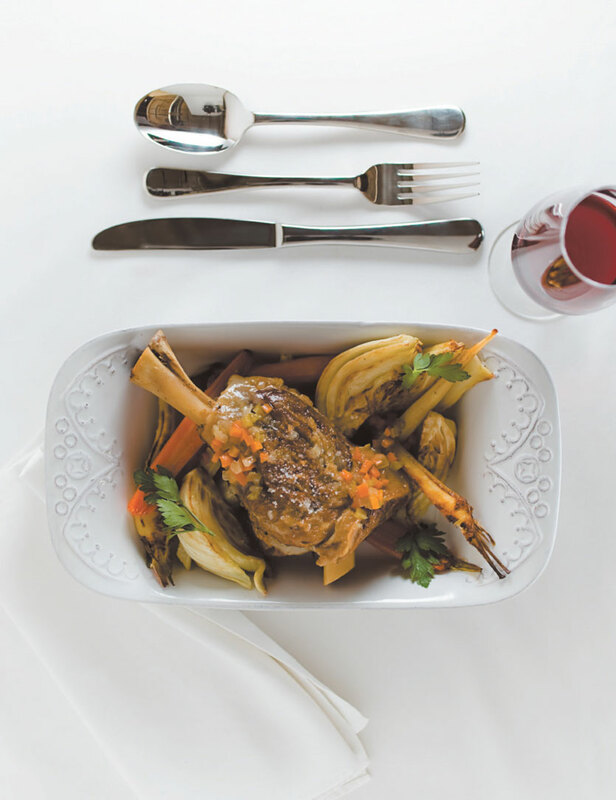 NOTE — Unlike the rack of lamb, shanks are really inexpensive. Slow cooking guarantees the tenderness of the meat. *Mountain oregano (from the Greek words «oros» which means mountain and «ganos» which means joy) has multiple tonic, curative and aromatic properties. It is sold dry on stems, and can be found in specialty stores.